The alarm quickly bought him back to reality; louder than usual, it had to be something large. The tiny green light on the handle of the metal detector winked to confirm the noise. It was metal alright; it never failed to give that buzz of excitement and intrigue. Utter silence for hours on end, then . . . that sound, the sound that meant it wasn’t all a waste of time. If this was the right shipwreck, only one piece of proof was needed. He was looking at what had to be the bronze cannon. Nick never had trouble with his conscience when recovering items like this. It wasn't stealing, it was retrieving. After all, this piece had been on the seabed for hundreds of years and if he didn't rescue it, who would? This was an area no one else would dive, it was too sensitive. He wasn’t justifying his actions. It was lost, now it’s found, simple. Nick struggled to keep his excitement down. He had a buyer who would pay quarter of a million pounds for a Spanish bronze, ‘Long nine’ cannon. Even if it wasn't Spanish it might be worth 150 thousand. Just a few more night’s work were required to retrieve it. Nick’s breathing started to tighten, the oxygen was running low. He reached down and gave a squirt of the pure O2 from the emergency bottle into the counter-lung on his chest. Every diving regulation in the world said this was the time to stop, but Nick had reasons for ignoring the rules. Maybe a quarter of a million reasons. It was time to head up to the surface and come back the following night; it was four in the morning anyway. Instead, he dug away with the trowel, working to expose that classic cannon shape. Something interrupted his dark, submersed world of absolute silence. Nick flicked the ear-piece off and froze. Holding his breath and standing motionless on the seabed, he listened. There it was, in the background, the distant sound of an engine; the almost imperceptible murmur of an inboard diesel. This was something bigger: not big as in a big ship with slow ponderous revolutions or the oh-so-slow thump of a fishing vessel, but something with higher revs, a faster, more powerful craft. It was getting louder. That's why he always used a re-breather, no noise, no bubbles. A quick clove-hitch around the cannon, then release the buoy, but not all the way up. It was made to sit three metres off the bottom, invisible from the surface, but … there were ways to find it again. The compass told Nick it was north to the anchor, hand-over-hand along the cable to the quick release. Keeping the mouth-piece clamped in his teeth, he took the diving set off, then clipped it to the anchor cable. He attached his tiny military metal detector to the diving set. Last edited by ATG; 18-09-2014 at 16:22. One final look around. Good. With one hand on the rope leading up, he knocked the slip off with a rock. The rope and anchor cable slowly drifted apart. Taking a good breath of oxygen, he turned the quarter-turn valve off on the mouthpiece making the diving set watertight and spat it out. Nick moved slowly up the rope to the surface, unflustered and breathing out all the way. Less than thirty seconds. Easy when you'd done it so many times. Near the surface, the ghostly shape of his yacht loomed into focus above. He took in the strange, almost flat hull just abaft amidships and the two-furled propellers behind which hung the long rudders. She was fast and … unique. Having anchored stern-to for this very reason, he released the rope and swam to the ladder. Up and onto Orelia's bathing platform at the rear and off came the face mask. Turning out the headlamp and taking great care to stand on a towel, he snatched another from the pulpit rail. The radar repeater by the wheel revealed the offending blip. The collision alarm was sounding its rhythmic warning; it was set to ten miles. Whatever it was, was still two miles away to the South. Close, but enough time … just. Slipping out of the fins and shorty wetsuit, he pulled up the boarding ladder and jumped naked into the cockpit. Nick hit three digits on the auto-pilot; 285 degrees. The gentle whine of the auto-helm kicked in. The wheel came alive, searching port and starboard, trying to keep the course but, as yet, Orelia wasn't making any way. Nick pulled on the self-furling mainsail halyard. The large triangle of white sail magically appeared from the mainmast. A quick pull on the outhaul to set it tight, then steal a look at the radar. One and a half miles. Whatever it was, it wasn’t hanging about. It was on a collision course with Nick’s slow moving yacht. Maybe it was heading from the Moroccan coast to the Isla De Alboran. Unlikely, he decided; the island was a military protected area. It looked like those aboard the approaching craft knew he was there, so he reached down and switched on the sailing lights. He then jumped back onto the bathing platform and undid the anchor line that was streaming out slowly astern. He clipped an old water container full of rocks to the wetsuit, mask and fins and lowered the lot gently over the side. It sank and was gone, about twenty metres north-west of the ditched anchor; I might even get that one back, he thought. There was now no evidence that anyone onboard had been diving. Picking up the towel he jumped back in the cockpit. The suspect was a little over a mile away and Nick could see the port and starboard steaming lights bearing down on his position. They have only just switched those on as well, he thought. This was not looking good. Orelia was beginning to pick up her course now that she had a little drive from the mainsail. A glance at the instruments told him there was only about five knots of north-easterly wind. He let the main sheet out a tad and she began to slip along. A quick pull on the roller furling jib sheet and she was just touching two knots. The cockpit was dry enough, so he slipped below to pull on some shorts and a T shirt. Nick had taken to shaving his head so that his wet hair couldn’t give him away. Putting the towels into a pre-filled sink of water, he settled into the navigation seat and studied the chart. He looked at his watch and wrote 04:11 next to Orelia’s present position, then drew a ‘cocked hat’ next to 03:10 and 02:10. To the casual observer, it would look like the yacht had just been on a normal passage. Finally, it was off with the waterproof headlamp, drying it on the paper towel and hanging it up on its home, a cup hook by the radar screen. Everything on board must have a home, then you just had to pick it up, not look for it first. The foreign engine noise was getting louder. He did some quick calculations, ten or so minutes to cover the two miles, whoever it was, was making twelve to fifteen knots. He squashed his face and scrunched up his eyes with his fists to make it look as though he was just a tired mariner on a long passage. Bump. Someone was alongside; Nick's cue to go up on deck. Looking through the porthole there was a glimpse of dark, wooden hull alongside. He switched on the saloon light and went stumbling on deck looking sleepy, with just a shade of anger. "What the!" he shouted, until he saw the guns. Then his mood changed, hands raised, non hostile. Two Moroccan customs men, were on board, pointing their ancient, wooden-stock rifles at him. He could see the younger one had no magazine, and no bolt! So, this one was harmless. The other had a bolt, and was sporting a rusty bayonet. Nice touch, he thought. The blood poisoning would probably kill you. May have one up the spout as well. They were both sweating profusely and motioning him back down into the saloon. Nick just had time to glance over at the launch; it was old, tired and dark, with a dated fisherman’s wheel-house. One thing was for certain, its speed didn’t match its appearance. He led them down the companionway stairs; easy does it, no sudden movements. Once below, the boat rocked to starboard; was that another passenger boarding? Nick looked up through the companionway. Someone used a dull torch to search around the cockpit and peer over the stern to the bathing platform. Then down into the cabin, came a naval officer, of a sort, with four gold rings on the shoulders, gold leaf on his cap. A bit over-kill for the skipper of a launch, wasn't it? He wore a side-arm in a leather pouch. Nick humoured them, played along. The launch revved its engine again. So, a fourth one had stayed on board. The yacht rocked as it motored away. "What can I do for you, officer?" The tiniest inclination of the head, and Nick took it to mean yes. Seeking permission to move, he went over to the saloon table, reached into the well in the middle and brought out four plastic glasses. He poured two generous measures and was about to pour the next one when the boss said “Two!” That made it clear, only two would be indulging tonight; maybe his boys weren't old enough? Nick picked up the glasses and offered the biggest to the boss. He nodded, meaning, put it down there. Nick had a decent pull on his glass then placed it on the table. The boss had four medal ribbons on his chest. Looking like an Admiral of the Fleet, his hands were behind his back like all good officers; his chin was slightly raised in a superior manner. He had the look of the desert about him, combined with that modern wealthier appearance, the golden skin colour; North African/Arab, Nick guessed. He was about 5ft 10ins, his hands were small and, if not exactly manicured, they had never done any labouring work. He had a thin and perfectly straight scar over his right eye and forehead, like a knife wound, not an accident. Under his immaculately tailored uniform he was probably quite fit, a good shape to him if not exactly a muscle bosun. Nick realised the man was not as young as he first thought; he was difficult to age, maybe 35. Over at the navigation table, the boss turned on the flexible light and looked at the chart carefully; bending down close to it he examined Orelia’s position, checking maybe, to see if someone might have made notes about where they were heading or what they were up to. There's nothing for you there, mate, thought Nick. The officer opened the log book and studied the pencil shorthand for course made good, speed and wind. Turning his attention to the brass chart dividers he picked them up and instead of squeezing the top part to make them open, he pulled them open, as you would with a compass at school. This guy’s never been to sea, thought Nick. The officer then made a show of walking the dividers across the chart but he hadn't set them on the latitude scale next to Orelia’s position. So what was he measuring? Nothing, this was all for show, for Nick and his boys to see. He nodded, as if all was well, keeping the dividers in his hand and proceeded with his tour. He picked up his whisky and downed it in one. He didn’t flinch, that was also for show. The man demanded, in heavily-accented English. "Oh, yes Sir, of course, right away." Nick moved to the chart table and opened the drawer. Immediately, the officer’s hand was on his arm, guiding him backwards out of the way. The officer rummaged through the drawer although the passport was right on top. He had a quick look at the back pages, but Nick suspected he was looking for something more interesting, some sort of trophy. Perhaps he would settle for a bottle of J.W? The intruder rummaged around inside the drawer and reached for a packet of unopened Marlboro. He looked over at Nick. "Please, please help yourself," Nick said. He opened the cigarettes, put one in his mouth and slipped the packet into his trouser pocket, along with the brass dividers. That's two things he's managed to pilfer and he's only been on board a few minutes. From his top pocket, the man pulled a Zippo and proceeded to light up. Nick decided to let his strict no smoking rules go on this occasion. The thief put the Zippo down on the chart table and continued his detailed study of the cabin. Lifting a cushion here, opening a drawer there, he looked into the sinkful of washing and curled his lip up in distaste. What's he want? Nick decided to take the bull by the horns. "Would you like a . . . ?" A palm came up in the international sign for stop, shut up. How long was this whipper-snapper going to keep this up? opportunity to look at the two decidedly nervous guards; they hadn't taken their eyes off him. He smiled at Bayonet brains, but got no reaction. If it got nasty, he’d be the one to watch. He had the eyes of a shark: soul-less black pits without a hint of humanity. The younger one was a puppy, trying to look tough. His gapped, almost gawky teeth were permanently on show. Nick could break this one in a second, and the guard knew it, too. He could tell by the way Gappy kept a safe distance. Nick was fit and solid, built like a rugby player, with the scars showing all over his shining pate and on most parts of his body to prove it. He knew he looked lived in. Nick smiled at the young man and he looked away. Good, he thought, he’s beaten already. The pretend Admiral made his way further forward searching and rummaging around. In the forward cabin, just above the anchor locker, he found the safe. "Bring." Nick was encouraged forward. The boss signalled for the safe to be opened. The boss uttered his first recognisable sentence. "Open, Mr Carter." Nick opened the combination safe but before he could put his hand in or step back, his vision swum in confusing swirls. He collapsed to his knees. Up until then, there was no warning of violence, no hint of trouble. His eyes were watering and he could feel something warm running down the back of his neck. There was a loud exchange between Bayonet and the Admiral. Nick, powerless on his knees, could feel the anger rise in him as his vision started to clear. He tried to come to his feet, but stopped as the bayonet was pushed hard into his back. Had it not been so blunt it would have pierced his skin. All three were talking excitedly and the boss was pulling everything out of the safe. Through the mist of his water-filled eyes Nick could see the boss had his old Navy Rolex on his wrist. In the meantime, Gappy was in the safe, he had something in his hand. The boss whacked the guard’s arm with his now drawn pistol. From his knees, Nick watched as the Admiral trousered the €1,560 he knew was in the roll of money. Nick and the boss made eye contact, he saw him nod towards Bayonet behind his back. "Hey!" was the last word that left Nick's lips. The dull thud of heavy rifle **** onto skull sent him to the floor, out cold. How about 'Fathomless' for a title...? 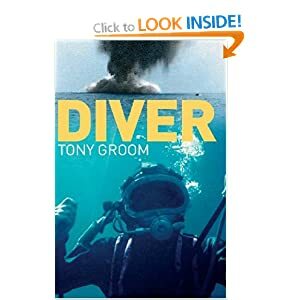 Ex Royal Navy Diver, Nick Carter, combines his fervour for diving and sailing when stealing antiquities from the Mediterranean Sea bed. Then he meets Mariyah and the two marry. A month later, Mariyah catches a train to Madrid and, en route, discovers she is pregnant. She is murdered and never completes her journey. Years later, back in the Mediterranean, Nick is once again diving illegally at night. The sound of an approaching boat forces him to surface. Three men dressed as customs officials board his boat, beat him up and leave him for dead, stealing his money, and Mariyah's pendant. Nick gives chase to Morocco, boards the thieves launch and stumbles across a cache of arms, grenades and, a nuclear Geiger counter. Nick calls a friend in the MoD. A British agent (Miles) arrives. Miles shows him a photo of the suspect, Hachim Hadda. He tells Nick that Hadda, the chief Madrid train bomber may be planning another, even bigger attack. It’s the man who robbed Nick; the man who murdered his pregnant wife. And now, it seems, he’s stolen his only physical link with her: the pendant. This is now personal. The agent offers Nick money to follow up leads. He refuses, but funds appear in his account. He is now, unwillingly, a British mercenary. Nick sails to Gibraltar in search of the ship. Miles, in the meantime, goes to Fes in central Morocco to pay off an informant. After the meeting he is pursued through the maze of streets by an armed man. He manages to leave the ancient city and hires a taxi to Casablanca. MI6 despatch military aircraft to Gibraltar. On board is a secret British mini submarine, a nuclear physicist, SBS, SAS and snipers. In Gibraltar, Nick identifies the tanker, investigates and is captured. Stripped naked, he is partially electrocuted, tortured, beaten and questioned by Hadda and his side-kick/lover, a sadistic Libyan woman, (Najia). Convinced he will die anyway, Najia tells him what she knows about Hadda’s plans. It is not a dirty bomb, it is far, far worse. Tens of thousands of innocent civilians will die. It would be a hideous radiological death, similar to the one the Russian dissident, Alexander Litvinenko, experienced in London in 2004. Sorry, I can’t tell you any more … TG. or he'd have to kill you...lol! I'd suggest something that's dive-related, but all the commonly-used terms are a little clichéd. First Stage, for example, would be quite nice. Reverse Squeeze is probably too cute! Safety stop doesn't really sound that exciting. Surface Interval? Thermocline? Sorry. All probably a bit silly. I'll re-read the first few pages and try again! I must admit to not being much of a reader (Time not permitting), but aren't book titles generally fairly straight forward. Something Like '' Below the Surface '' or '' Scratching the Surface '' ? Not being a kiss ****, but I'd be very interested in reading the full version when it's printed! Good luck with it Tony. With Al's agreement this thread has also been copied onto NSN 6645, just in case any military watch collectors have not seen it on the main forum.